In Demand. A Company Thesaurus. 24 Jul In Demand. A Company Thesaurus. I pulled up notes from one of my old day planners the other day – searching for content on a current project but also a nice way to reminisce and to reflect. Something else leapt off the pages. I needed a Rosetta Stone to decipher the sometimes cryptic verbiage that seemed to wind through my notes – terms that might have made sense to me 10 years ago might have well as been in Egyptian today. The more I scanned my own records the more amazed I was – and it made me reflect on how often we create our own version of a foreign language in the business world – acronyms, abbreviations, catch-phrases – to describe what we do in ways that can make it virtually impossible for someone outside the company to have any idea of what we’re talking about. Check that – sometimes it’s difficult for us to know too. Ever sat in a meeting and listened to a colleague throw out the latest hot term and have absolutely no idea of what it meant? Ever reflected on how many ways we can find to pull up a tired cliché when simply stating the obvious is the better recourse? Ever contemplated building your own version of a company thesaurus/listing of key terms and wonder how many copies you could sell the first day? Now – truth be told (and of course I’ll use a metaphor) – I am guilty of calling the kettle black – while being arguably the biggest pot in the room. Scanning my own notes I find my use of hot terms is at or near the point of nauseating – and I sprinkled my talks with the same verbiage. For those that worked with me, my apologies for these classics….”net-net, keep me in the loop, the bottom line, the 800 lb gorilla, bells and whistles”…..
OK, you get the point. I wasn’t just a victim – I helped spread the contagion. Add to that – the convoluted use of abbreviations, the disproportionate creation of acronyms, and the constant urge to grab hold of the latest popular terms and we have the perfect formula for what I call corporate dyslexia. After a while every company needs either a dictionary or a thesaurus to conduct daily business – maybe because all of us help spread the disease, not stifle it. I am reminded of the story of the vaunted Enigma Machine and Germany in World War II as I write this. Up until 1942 the Fatherland had an almost impenetrable code for communication with their U-Boats – created by a typewriter type device that enciphered and deciphered messages at a rate the Allies couldn’t crack. Their own special language – impenetrable. Until February of 1942 when the HMS Petard depth-charged the U-559 off the coast of Palestine and three intrepid British sailors swam out to the sinking vessel and discovered – to their shock – a fully functional Enigma along with the current codebook of keys. Frantically wrapping it in waterproof materials they managed to get it off the boat with only seconds to spare. Two of the men – Lieutenant Anthony Fasson and Able Seaman Collin Grazier were not so lucky. They went down with the U-Boat – sacrificing their own lives but offering Great Britain the lasting key to finally breaking the German code. 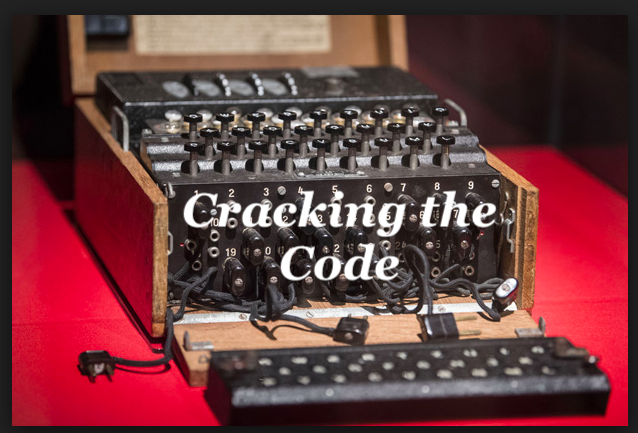 The tide of WWII shifted dramatically as a result – eventually the British developed the Bombe – an electronic devise to decipher the Enigma messages – the ultimate legacy of those two brave men. There are no Enigma Machines per se in our careers – nor Bombes to decipher them. But if you don’t believe we speak in code in the corporate world – and in most careers – think again. That thesaurus might just be a good idea after all….maybe I’ll put it on my list of actionable items…to be completed ASAP…once the ARCO Project is complete of course.